Tjukurti Tjakamarra is one of the lesser known painters at Papunya at the start of the Aboriginal art movement. In the early part of his career, he painted some magical paintings on Composition board. His Early paintings were less than 60 cm x 60 cm. Many of his early works are ritual and contain secret imagery meant only for the eyes of initiated men. His later works are on Canvass but he maintains a high standard and precise linework. The aim of this article is to assist readers in identifying if their Aboriginal painting is by Tjukurti Tjakamarra. It compares examples of his work. It also gives some background to the life of this fascinating artist. 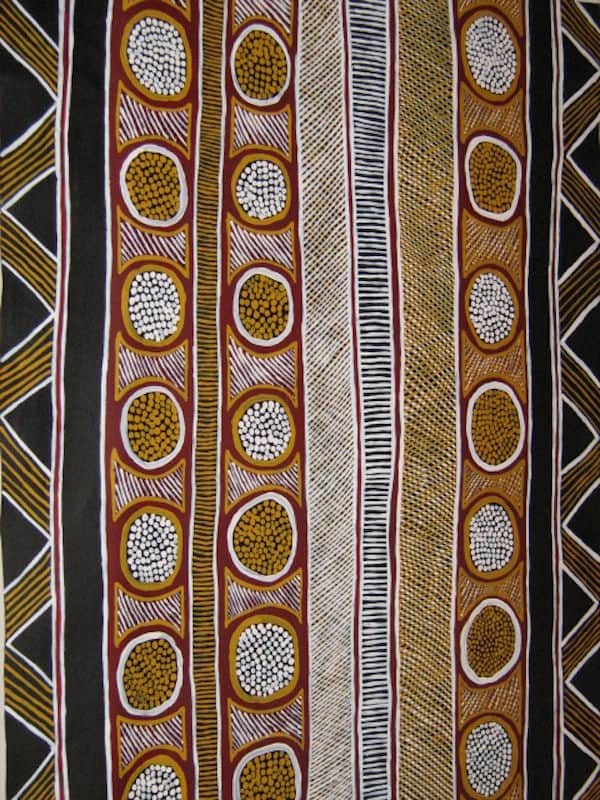 If you have a Tjukurti Tjakamarra Aboriginal painting to sell please contact me. If you want to know what your Tjukurti Tjakamarra painting is worth please feel free to send me a Jpeg. I would love to see it. Tjukurti Tjakamarra Was born around 1932 in the Pollock Hills. For the first half of his life, he lived a nomadic, hunter-gatherer lifestyle. Initiated into Pintupi custom he was a keeper of storylines. He and his family were mostly based along the western shore of Lake Mackay. They often traveled with another group and these families became some of the last nomadic groups left in the desert. In 1963, Tjukurti Tjakamarra decided that he would go and join his relatives, who were living at Papunya settlement. Papunya is traditionally Luritja land, but the Pintupi had become displaced by nuclear weapons tests. West and his family walked to Papunya and met the welfare officers on the way. Freddy West Tjakamarra by this time had two wives: Parara and Payu who had family in Papunya. Tjukurti Tjakamarra was an early member of Geoffrey Bardon’s men’s painting group. In 1972 Freddy along with other artists like John Tjakamarra Yala Yala and Long Jack became founding members and initial shareholders of Papunya Tula. 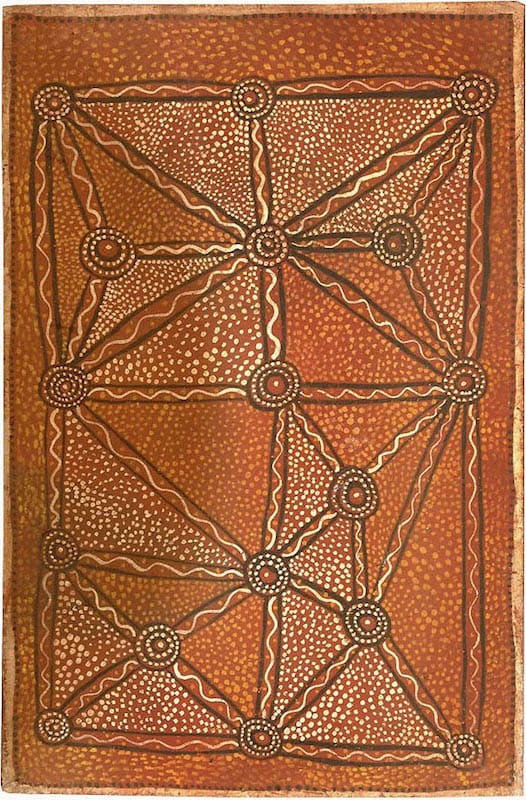 Papunya Tula was a company owned by aboriginals to assist with aboriginal art sales. Papunya was a hectic place with many clans and west did not stay in the main settlement for long. Instead, he moved and painted at a place called Yayayi. Yayayi was a small outstation 40 kilometers from Papunya. Several other artists were also based at Yayavi including John Tjakamarra and Yala Yala Gibbs. Peter Fannin would drive out to Yayayi to deliver painting supplies and pick up pieces of art for sale. Yayayi artists would often work together on joint artworks. They would sit on all sides of a canvass completing sections. One of Tjukurti Tjakamarra’s joint artworks made it into Australian Perspecta in 1981. This was an important moment in the legitimization of Western Desert painting by the art establishment. It caused international interest and became a catalyst for a re-appraisal of the identity of Australian art. Tjukurti Tjakamarra campaigned strongly within the Pintupi community for his clansmen to leave Papunya. He felt they should return to their traditional country in the west. In 1981 he leads 300 Pintupi people back west and set up the community of Kintore.